As the Stage 3 nears its end, the competition is getting stiffer and more heated with each episode. This week’s episodes saw an interesting melee of events. Nisa was the lowest ranked artist of the week. She was taken out of the safety of the Artist Hangout and thrown into the Battle of the Bench. Siddhant was ranked the top artist of the week for the second week in a row. Zoe (one of the benched artists from the previous week) opted out of the Battle of the Bench using the Power Pin that she had received earlier on in the show, which put Chochung in the battle by default against Nisa and Urgen. The three artists fought it out in a powerful musical showdown and the double elimination of the week saw Nisa and Chochung eliminated as Urgen headed back to safety. Contestants of The Stage 3. Andrea Jeremiah was the guest judge for the first episode and she sang a powerful rendition of an original track titled ‘Darkest Dawn’. 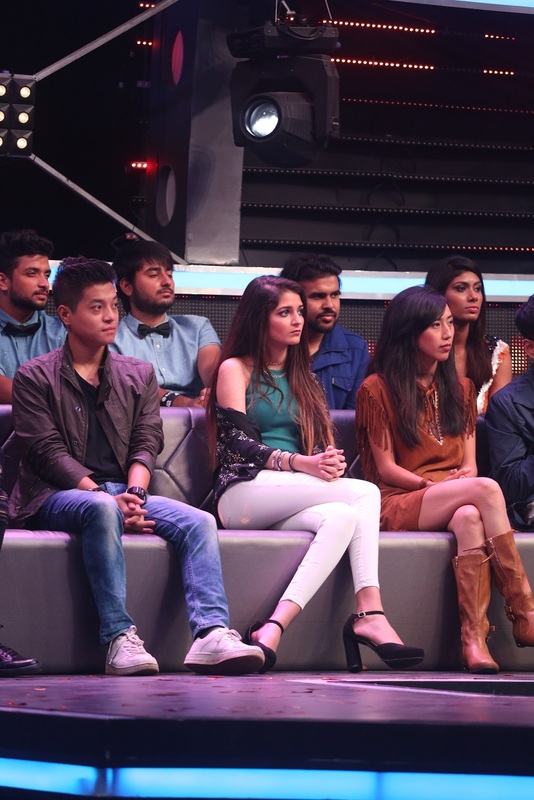 The theme for the Saturday episode incorporated the ‘superstars’ from season 1 and 2 of The Stage as the artists got ready to join the Top 6 contestants of the ongoing season to perform duets. The first performance of the night was by Zoe and winner of The Stage‘s first season Yatharth as they sang Zayn Malik and Sia’s chart buster ‘Dusk Till Dawn’. The performance left judge Monica Dogra in tears and was highly lauded by all the judges. Next up was Arish’s pairing with season 2’s finalist Abhishek Gurung as the duo took to stage and sang U2 and Mary J Blige’s ‘One’. The judges were on their feet by the end of the performance and Vishal Dadlani (in a beautiful gesture) ended up giving a Power Pin to Abhishek as a token of appreciation for being an incredible singer and giving such a powerful performance. Jalandhar Massive teamed up with ex-contestant Raghav Meattle next as they performed Justin Timberlake’s ‘Mirror’. Their performance was not very well received by the judges and the band received a ton of feedback for improvement. Siddhant and Sharvi Yadav (the season two winner) took to the stage next as they performed Prince’s ‘Purple Rain’. All the judges (Dadlani, Dogra, Ehsaan Noorani and Devraj Sanyal) gave the artists glowing feedback and highly commended their performance. The cherry on the cake was Dadlani taking centerstage as Sharvi, Dadlani and Siddhant performed the iconic rock ‘n’ roll song together in a moment that will be remembered for a long time to come. Shaurya and season 1 contestant Soundarya Jayacharan came up next as they sang John Legend and Ariana Grande’s ‘Beauty and the Beast’. The pairing received mixed feedback from the judges and guest judge Andrea was in shock over the uniqueness of Shaurya’s voice. Urgen and season one contestant Anushka Shahaney performed next as they sang Ariana Grande and Stevie Wonder’s ‘Faith’. Delivering a super peppy and enjoyable performance, the judges too commented on the fun element of their song. The Sunday episode saw Malaika Arora as the guest judge as she answered some music related rapid fire questions and then stunned her way onto the judging panel. The theme for this episode was Fan Requests as the artists sang tracks that were picked out for them by fans of the show world over. Arish was the first one to perform as he sang Harry Styles’ ‘Sign of the Times’. The song was greatly appreciated by all the judges. Up next was Zoe who is the only girl left in the competition at this stage. Her performance left all the judges moved and they all applauded her. Malaika felt that Zoe is the ‘perfect package as she has it all’. Jalandhar Massive came up next as they sang Savage Garden’s ‘Truly Madly Deeply’. A truly beautiful performance, they even added an Indian touch to the act in the form of an alaap. The fusion left everyone floored. Dadlani gave the band some important feedback and Noorani was a true fan of the performance. Next up was Siddhant-in-a-skirt as he performed to Guns ‘N’ Roses’ ‘Welcome To The Jungle’. Every single person on screen was on their feet by the end of his performance and the feedback received from the judges was through the roof. All praise, no one could stop gushing over Siddhant’s performance and talent as his rendition easily became one of the season’s most memorable performances. Malaika Arora proceeded to have some fun with the contestants thereafter and all the boys were made to catwalk their way down the stage. Zoe and Dandekar joined the men at the end as they strutted their stuff. Next up was Shaurya as he sang Lana Del Rey’s ‘Young and Beautiful’. Although he did not receive the best feedback from the judges for his performance, there was some form of respite for him in the form of encouraging words from Dadlani and Dogra. Urgen’s fans requested him to sing ‘Too Good at Goodbyes’ by Sam Smith. He received lukewarm feedback from the judges as they told him they expect a lot more from his performances and that they just didn’t feel that he “connected” with the song or that his heart was in it. Dogra however, maintained her soft spot for Urgen and gave him some words of comfort. After conferring for a while, the judges decided to bench Jalandhar Massive and Shaurya and saved Siddhant, Arish, Zoe and Urgen.